Made with 76% pre-consumer recycled material, originally used in the production of automotive part trays. 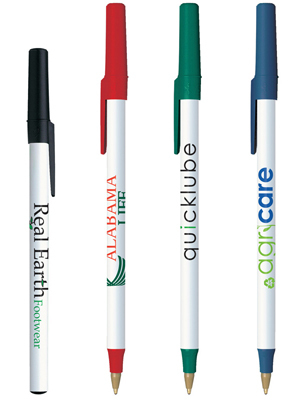 Most popular stick pen in promotional products. Over 1.2 miles of writing ink makes it long lasting! Medium Point: Black, Blue, Red or Purple Ink. Fine Point: Black or Blue Ink. Trim Color : Choose 1 trim color from the selection shown. #RSECO includes a White barrel. Packaging: Standard - 6 lbs. (approx.) @ 500 per carton. Special packaging (click here).